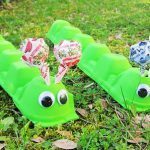 Recycle those egg carton and create your own unique litter bug in the process. Cut individual segment from egg carton for ‘body’ of bug. Use Craft Glue Dots to adhere the egg carton segments together to form the body of the bug. Make shrink art face pieces from the #6 plastic or use other found objects such as mismatched buttons to create the face. Adhere face art to front of egg carton with Mini Glue Dots. Cut ‘claw’ shapes from foam pieces used in packaging, such as packing peanuts. Adhere 'claws' to body with Craft Glue Dots. 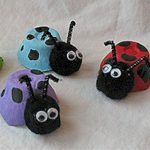 Cut off gift bag handles and adhere egg carton body with Craft Glue Dots to create bug legs. Cut apart plastic ring in half to form antennae and adhere to head with Craft Glue Dots. Have the kids draw extra details with a kid-friendly marker. This craft reprinted courtesy of Glue Dots. Glue Dots® Adhesives – The New Way to Glue™! Consumers have found endless uses for Glue Dots around the home, school, and office. Glue Dots adhesives are acid-free, lignin-free, non-toxic, easy-to-use, and require no dry time. Glue Dots adhesives provide a strong, versatile and safe adhesive solution that can be used by the entire family. 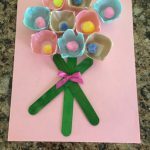 Use Glue Dots adhesives for school projects, home décor, and around the office – the possibilities are endless!